Jamie McKeogh, Cathal Guinan and Daithi Melia all hail from Tullamore, Co.Offaly with Co. Tipperary born Gavin Strappe completing the quartet. All four members grew up immersed in Irish traditional music and culture which is reflected by the band collectively achieving over twenty All-Ireland titles at Fleadh Cheoil na hÉireann competitions. They have now developed their own unique style of music influenced by American Folk music whilst staying true to their Irish roots. 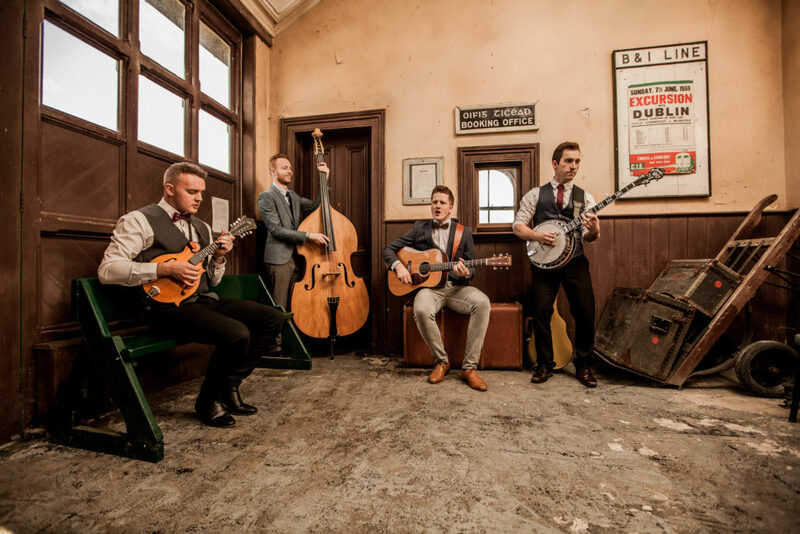 Described as ‘The best Irish group so far in bluegrass’ this sharply dressed outfit deliver an energy-fuelled, foot-stomping live performance. All multi-instrumentalists, JigJam interchange between banjos, guitars, fiddles, mandolins and double bass onstage which creates an experience which is pleasing to both the eye and the ear. ‘JigJam are as close to authentic as you can get without having been raised on grits and fried squirrel’ – Sean Laffey of Irish Music Magazine. ‘Absolutely Terrific!’ – Pat Kenny of Newstalk.